Imagine a world where you could actually park inside your garage. What if we told you that dream could be a reality with just a weekend’s worth of work? 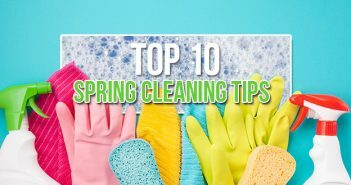 We rounded up expert garage cleaning tips and turned them into a five-step plan you can use to get your garage organized quickly and painlessly. The first step to decluttering your garage is to find out what’s in it. Pick a section of your garage to start with and pull everything out onto the driveway to sort through. Besides making it easier to work, this garage cleaning tip will also allow you to see what space you have to work with and what types of storage might work best when it’s time to organize the items you’re keeping. When cleaning out a garage, where should you begin? Once you’ve pulled everything out, it’s time to set some ground rules for deciding what to keep. This garage cleaning tip will speed up the process by preventing you from agonizing over each individual item. When deciding what to keep and what to throw away, ask yourself: “Is this item in the garage for a reason, or because I didn’t know what to do with it?” If it’s the latter, either find a use for it or get rid of it. Items you’ve used more than once in the past year. Tools you can’t easily rent or borrow. Whatever doesn’t make your “keep” list is, by default, clutter. Don’t let it hang around your garage any longer. With your “keep” items set aside, start going through the rest of the stuff you pulled out of the garage. Identify items you’d like to sell or donate first. Have plastic bins, cardboard boxes or bags on hand so that you can pack up donation items as you work and stash them somewhere out of the way. Bag up or box up junk that doesn’t make the “keep,” “sell” or “donate” piles. If you’ve rented a dumpster for your weekend cleanout, toss the garbage bags into the container as you go. 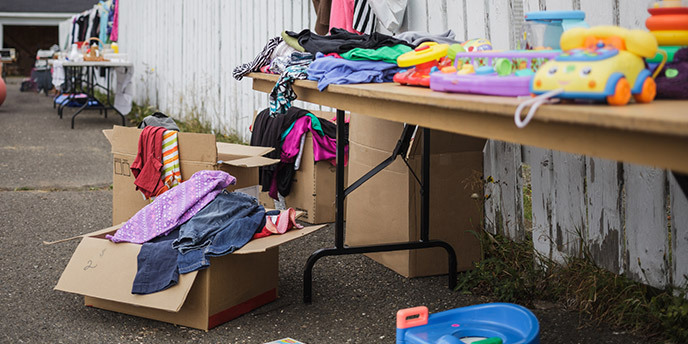 If you’d like to make a little money off of your garage cleanout, consider hosting a yard sale or selling it online. Craigslist, Freecycle and Facebook Marketplace are all great places to list your items or advertise your yard sale. Do a little research online to help you decide how to price your items. For the garage clutter that can’t be donated or sold, it’s time to get rid of it. 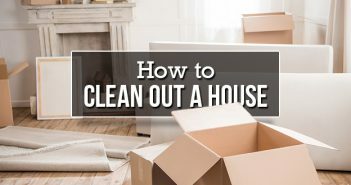 The best junk removal solution for your project will depend on how much stuff you have, and the items you’re throwing away. Your garage cleanout may leave you with a pile of stuff that’s too big for the curb—especially if you’re getting rid of lots of large items such as old patio furniture or lawn care equipment. If you think you’ll end up with more than a couple pickup truck loads, it might be easiest to rent a dumpster, if you haven’t already. What size dumpster do I need for a garage cleanout? Most garage cleanouts can be completed with a 10 yard dumpster rental, but this can vary depending on how much stuff you’re throwing away. To find the right container for your garage cleanup, call 833-499-7507 for a size recommendation from a waste removal expert. While you’ve got your garage entirely cleaned out, it might be a good idea to scrub it down before putting things back. In general, the best way to clean up a garage is from top to bottom. Start by dusting off and wiping down the tops of your cabinets, shelves and refrigerator if you have one. Then, wipe down your garage walls and the doors of your fridge and cabinets with a warm, damp cloth and a mild household detergent. Next, sweep the floor to get rid of the dust you’ve shaken loose. Finish up by mopping and hosing off the floor. Allow the floors two to four hours to dry before putting things away. Remove motor oil stains using cat litter, dish soap and a wire scrub brush. Wipe away any mold using either bleach or vinegar diluted with warm water. Use a sponge mop to clean garage walls from top to bottom. Once finished, use a flat head mop with a microfiber cloth to dry the wall. After mopping, use a floor fan to speed up the floor drying process. Now that you’ve whittled your inventory down and finished your garage cleanup, seize the opportunity to keep clutter from building back up. So, what’s the best way to organize a garage? It depends on what exactly you need to store. Use a pegboard to organize hand tools such as hammers and hacksaws. Use wall hooks to hold larger tools such as rakes and shovels, or stand these items up in a large, sturdy bin. What’s the best way to keep clutter at bay after a garage cleanout? Cleaning out your garage doesn’t have to be overwhelming. With these tips, you can tackle it one step at a time and reclaim your parking space within a single weekend. Have your own advice to share? Let us know in the comments! For advice on organizing other rooms, check out our ridiculously thorough Guide to Decluttering Your Home. Sorting is perhaps the most important thing. Next comes getting rid of items we don’t require anymore! I would recommend to avail the services of a professional junk removal company, as they are well versed in hauling heavy materials like old refrigerators and machinery which are usually stored for years in Garage. Moreover, they perform the whole job in a safe, secure and eco-friendly manner. I found out my HOA pays our trash hauling company to do bulk picks for free. All I have to do is get it to the curb!